Hear firsthand from multitudes of people whose lives were influenced, inspired, and even transformed by the compassion, generosity, and leadership of Larry H. Miller. Larry H. Miller played by his own rules. Owner of an NBA franchise and founder of one of the country's largest automotive retail groups, Larry was a college dropout who went on to buy or build nearly one hundred businesses. While his life as a successful businessman played out in public, his health challenges, as well as his quiet acts of service, were known to very few. These stories of an ordinary-yet-extraordinary man will inspire listeners to find and live their own greatness by following Larry's example of working hard at something he loved, applying his God-given talents in service to others, and allowing his life to be guided by something greater than himself. This book is a guide for anyone who wishes to find success in today's busy world. 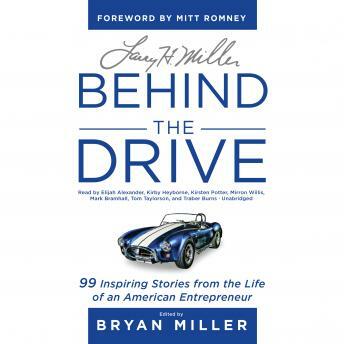 The stories in Behind the Drive have the power to lift and inspire the next generation of leaders and entrepreneurs, as well as help everyone discover Larry's formula for success: do work you love, get better at it every day, and serve others.